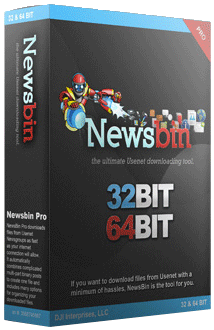 Newsbin Pro downloads files from Usenet Newsgroups as fast as your internet connection will allow. You can request a Trial Key including access to our Usenet Search Service, good for 15 days. We have released version 6.72. It has bug fixes to the 6.71 version and works on XP and Windows 2003 again. Full write up the changes are in this Forum Announcement or you can download the release from the Newsbin Download Page. Search queries from Newsbin Internet Search are similar to the popular search engines. You enter keywords into the "Search" field on the Search tab separated by spaces. Make sure the Search Source is set to "Internet". The order of the keywords doesn't matter, and all keywords must exist in the subject of a post to have a successful match (a boolean AND is assumed by default). The boolean operators available are AND (default), | (OR), and - (NOT). These operators must be entered in upper case for them to apply. Using lower case will match on the literal word instead of using it as a boolean operator. this that those Matches subjects containing all the words "this", "that", and "those"
this that -those Matches subjects containing the words "this" and "that" but not containing the word "those"
this | that -those Matches subjects containing either "this" or "that" but not "those"
If you enter an asterisk (*) by itself in the search field, it will return the latest few thousand posts recently added to the database. Since we feed the database constantly, the results will be changing each time you use it. Clicking the "Load Older Posts" button will work its way back adding more posts each time. If you enter an asterisk AND choose a group in the "Search in Groups" field then all the posts for the current day for those groups will be shown. Each time you click the button "Load Older Posts", you will get an additional day of results added to the list. This is a great way to check recent posts to a specific group without having to download headers. It works by either specifying individual groups or a group folder as configured in the Groups tab. will only return posts that have those four words in that order in the subject. If there are quotes in the phrase, you can escape each quote with a backslash. The entire string needs to be quoted, we currently do not support mixing phrase search and boolean search in the same query. You can use the "Search in Groups" dropdown box to specify a group to target for your search (version 6+). You can also select a group folder you have set up in the Groups tab. Keep in mind that we only index the binaries groups, and we do not index any picture groups (i.e. newsgroups with the word "picture" in them). Newsbin Internet Search can query the last 2300+ days of posts to most of the binaries newsgroups on Usenet. You can use the Age setting on the Search tab to limit how many days the query will search if you want more recent results or if your news server does not have 2300+ days worth of posts. Just because Internet Search returns matches doesn't mean your news server still has the post. Newsbin also allows you to apply a size filter to your searches. Set a maximum and/or a minium file size using the Max Size and Min Size dropdown boxes and only search results referencing posts less than the maximum size and/or greater than the minium size will be displayed. When search results return, the "Search" field reverts to using Regular Expression style matching just like the post list and the Local search mechanism. If you have specific questions about how to use Newsbin Internet Search or have suggestions, use our Newsbin Technical Support Form or post to the Newsbin Forums. To sign up, log into the Newsbin Control Panel and select the Search product you want under "Newsbin Product". Once payment is accepted Internet Search will work as long as Newsbin is registered with the same key reflected in your Control Panel screen. You don't have to change anything else with your Newsbin configuration. Internet Search is only available in Newsbin 5.42 and above as an optional service. The Local Search function which searches previously downloaded headers still exists in Newsbin. You can switch to it by changing from "Internet" to "Local" in the Search tab. Feel free to send comments or suggestions to us through our Technical Support Form.